Cooking with your kids is a great way to spend time together while teaching important life skills and learning about healthy eating. If kids have a say in the menu and help with the preparation they are much more likely to eat healthfully and try new things. 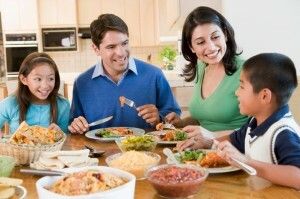 When planning meals, talk about the importance of good nutrition and balance in your diet. Then, get in the kitchen and start cooking! Here are some tips to help kids (and grown ups) enjoy their time cooking! 1. Take your time looking at recipes and deciding what to make. If the recipe uses the stove or sharp knives, make sure an adult is available for supervision and help, if necessary. 2. Read the recipe from start to finish before getting in the kitchen! You need to make sure you have all the ingredients, all the tools and that you understand each step in the recipe before you start. It is no fun to get halfway through a recipe only to find out you don’t have the right pan or an egg! 3. Understand food safety! Always wash your hands before getting started. Also, if you use a cutting board and any utensils for any raw meat , make sure you wash them with hot, soapy water before using for anything else. 4. After cooking, keep hot food hot (over 140 degrees) and cold foods cold (under 40 degrees). Don’t let food sit at room temperature! 5. Take the recipe one step at a time! Follow the recipe step by step so you don’t skip something important. When you get to the end of the recipe, read it one more time to make sure you didn’t leave anything out. Here’s a trick: Put all the ingredients you will need on a tray. When the tray is empty, you’ll know you didn’t leave anything out. 6. Clean up as you go! It makes less work in the end and keeps your work area safer. It is a good idea to soak any utensils in the sink or put them in the dishwasher. However, NEVER put a sharp knife in a sink with soapy water – when you reach in you may grab the knife and cut yourself! 7. Don’t forget to wipe down the counters when you are all done! 8. Check all the appliances to be sure they have been turned off. Also, put away any small appliances (mixer, food processor) you may have used. If kids learn to cook they will be able to feed themselves better as adults. Avoiding processed foods is easier when you know how to cook – even if only the simplest things. Learning to grill a grass fed steak and steam vegetables or toss a salad is as easy as it gets! Shop online and let Topline Foods deliver all natural and organic foods to your home We provide organic grass fed beef, all natural and organic chicken, wild caught seafood and so much more! This entry was written by Terese, posted on September 26, 2011 at 11:47 am, filed under Blog, Education and tagged all natural beef, Arizona grass fed organic beef, grass fed beef, grass fed meat online, organic beef Phoenix, organic meat, organic meat online, Phoenix grass fed beef, Phoenix organic grass fed beef, Scottsdale organic, Scottsdale organic grass fed beef, steaks by mail order. Bookmark the permalink. Follow any comments here with the RSS feed for this post. Both comments and trackbacks are currently closed.